A memoir of Richard Réti by his elder brother. Rudolph Réti (1885-1957) was a composer, pianist and writer on music. ‘Richard Réti was born on 28 May 1889 in Bösing (the German name for the little town then changed temporarily to the Hungarian Bazin, and later to the Slovakian Pezinok) as the third son of the physician Samuel Réti and his wife Anna. A son Otto had died in infancy. Mother often complained that Otto would probably have fulfilled what in both of us was only promised, for he had been a true infant prodigy, understanding whatever was said to him and, though not yet able to speak, capable of singing at true pitch any melody he heard. I was born before midnight on 27 November 1885, and to the day three and a half years later, on the morning of 28 May 1889, Richard followed. While I was said to have greeted the world with a fearful noise, Richard was so completely silent that even Father, a doctor, was at first not sure whether he was alive at all. Father later remarked that Richard was so little impressed by this world that he did not consider it worthwhile to comment. My parents remained in Serbia for several years. There I was born. When I was about two years of age, the family returned to Hungary, where my father acquired a sanatorium in Bösing. There Richard was born. With two sons, and already mindful of their education, the family moved to Vienna, where Father established a medical practice. The family, however, spent its summers at Father’s sanatorium in Bösing, a resort famous for its mineral baths and but an hour’s distance from Vienna. The Vienna of 1890 was not only a political, medical and cultural center in general, but in it two arts, very different in nature, flourished: music and chess. Richard became a chessplayer and I a musician. My earliest memories of Richard’s interest in chess may sound far fetched. But they are true. On winter evenings, Father and Mother used to play a game of chess. We children were allowed to watch. I, then almost ten, had been taught the moves and already was audacious enough to offer my advice as a kibitzer. Richard, on the other hand, too young (as my parents thought) to be even introduced to the rules of the game, always sat quietly watching, without uttering a word. One day, however, he suddenly asked permission to play. Richard sat down, played – and won. A second game followed immediately, with the same result. Soon, however, this whole episode seems to have been forgotten. Other interests caused my parents to discontinue their regular chess games, and no-one paid attention to Richard’s chess activities, which, if at all, he was left to carry out quite on his own. Six years later, when he was 12, we were made aware that his interest was still very much alive. That particular summer, the family was staying in the country, while Father continued his practice in nearby Vienna and visited us over weekends. Richard, instead of playing with other children, spent a great part of his time bent quietly over his chessboard at a little table Mother had prepared for him in the garden. Such praise from an acknowledged expert impressed Father and Mother very much, but their natural parental pride was somewhat overshadowed by a feeling that their two sons, each of whom spent most of his time at the keyboard or chessboard respectively, might perhaps be lured into careers of an uncertain future. Toward the end of that summer, Mother, Richard and I were suddenly called to Vienna. Father underwent emergency surgery. He did not recover. Father’s death brought a grievous change in our way of life. We moved from our spacious apartment beside St Stephen’s Cathedral to one of the outer boroughs. There, Mother saw to it that our studies did not suffer, but she imposed a rather stringent financial rein on all our other activities. Meanwhile, Richard had heeded Gottschall’s advice, and, although by no means endangering his ordinary school work, concentrated more than ever on chess. To his disappointment, however, his only opportunity to play was with some of his fellow students, by whom he was soon dubbed “The Invincible”. Yet he longed with mixed feelings of excitement and awe to sit down for a game with a master. The boasts of his friends in which I rejoiced to join, that he could conquer anyone, given the chance, he dismissed rather indignantly. His prediction came all too true. For I, then 17, had decided to take this matter into my own hands. Carl Schlechter, the leading figure among Vienna’s chessplayers, frequent first prize-winner in international tournaments, lived not far from us. With all the confidence of my 17 years, I wrote Schlechter asking for a meeting with my brother and a possible examination of his ability in chess. Schlechter’s answer came by return mail. The request was very courteously granted though, as I remember, it was not without a touch of skepticism about the mastery of the 13-year-old boy, whose powers I had perhaps described too enthusiastically. The game started and, to my horror, after barely three minutes and not more than eight to nine moves, Richard had lost. Schlechter quickly suggested a second game. By this time a completely unperturbed Richard had marshalled his forces. Although he lost again, this game lasted more than an hour. After about 15 moves had been very quickly made, both players started to ponder over each move, and by the time Richard finally conceded defeat, Schlechter remarked: “You have certainly given me some trouble.” Then turning to me he added, “for his age, this is certainly exceptional”. “In the Amateur Chess Club, in the second borough”, Richard replied, half timid, half proud. This seemed more than a little incredible to us, for the famous Wiener Schachklub was a rather elegant meeting place where rich industrialists gathered to play – cards. Chess itself was relegated to two smaller rooms where, however, under the wing of Baron Rothschild, an enthusiastic chessplayer, the cream of Viennese chess masters, such as Schlechter himself, Georg Marco, Halprin, etc., met. Upon Schlechter’s initiative, Richard, the first adolescent to be so honored, was invited to join. Here it may be said that although Richard showed a decided inclination toward chess, the game was not, at that time, the sole – or, for that matter, even the main – subject toward which he directed his energies. In fact, most of his time was devoted to his regular studies in the Gymnasium, that middle-European counterpart of the prep-school in the English-speaking world. Richard ranked as a good, although hardly outstanding, student. In his studies he seemed to lack the ambition to impress anyone with his achievements, with one exception: in mathematics. In this he led his class, if not the whole school. Later, even much later, he always maintained that chess and mathematics actually have little in common, and that the alleged similarity is entirely a surface phenomenon, which quickly disappears for those who probe the inner depths of both mathematics and chess. At any rate, by having to attend school regularly, Richard’s admission to the great club did not at first increase his “chess status” to any noticeable degree. There, to Richard’s chagrin, the masters did not want to play chess. Not only, as he often remarked sadly, did they not want to play with him, the amateur, but they did not even want to play with each other – except perhaps in the annual tournaments, where they vied to win awards. Only in one respect did the new environment prove useful to Richard’s development: the club’s well-equipped chess library was now at his disposal. Up to that time, Richard’s sole reference book had been good old Dufresne’s Lehrbuch des Schachspiels. The “Dufresne” enjoyed immense popularity in the German-speaking world. Charming, yet rather primitive and already outdated at that time, it was not an adequate text for one who strove for higher goals. But now in the club all the professional treatises in German as well as in other languages were neatly sitting on the shelves side by side with the various tournament books recording all the important games in the history of chess. Here in the club’s library Richard was to be found every Saturday and Sunday afternoon, the only days when his school schedule permitted it, trying to unravel the secrets of the game. About three years later, he entered the arena of competing champions. As it happened, we were spending our usual summer in Bösing, which belonged at that time to Hungary. The Hungarian Chess Federation had just announced a national tournament to take place in Székesfehérvár during August of that year (1907), and in which almost all the best-known Hungarian players with the exception of Géza Maróczy, the most famous of the Hungarian team, were to participate. To his surprise – for he had been warned that it might be considered audacious to apply for competition with acknowledged masters, even masters of national fame – Richard was accepted. The result was encouraging to Richard, for although he did not come out on top he played so well, considering his years, that his performance caused a minor sensation in Hungarian chess circles. His next public venture seems, perhaps in retrospect, to have been a step forward, though at the time it appeared completely disastrous. The Wiener Schachklub was arranging an international tournament, in which, with very few exceptions, all the great masters of the time were to take part. Just a moment before the tournament began, one master unexpectedly had to be replaced. After heated debate in the committee, Richard was asked to step in. The result, to make a long story short, was that he did not win one game. However, he did draw three, among them one against Důras, the Czech champion, who shared the first prize with Schlechter and Maróczy; had Důras not drawn with Richard, he would have become the sole winner. Schlechter and Maróczy, who thus were able to come out on top, looked with enthusiasm upon the performance of this “young talent”, who had made their triumph possible. Yet in the eyes of the general chess public, which followed the newspaper reports avidly, but was for the most part unaware of Richard’s age, his reputation as a certain loser was firmly established. This, however, had the not undesirable effect of somewhat dampening his eagerness for a chess career – at least for the time being. Instead, he applied himself to his studies at the University of Vienna, which he had just entered as a student of mathematics. During the next years, mathematics and, to some extent, physics, became Richard’s main interests. He did particularly well in the sphere of pure mathematics and theory of numbers, and drew the special attention of several of his professors to this part of his work. However, Richard was just on the threshold of his doctorate when an event occurred which interrupted not only his own plans and hopes but those of millions of young people the world over: the First World War. Richard was called up but fortunately, owing to his somewhat weak constitution, he was not assigned to combat but was given clerical work. Far from Vienna, in an outpost of the Austro-Hungarian monarchy near the Serbian border, he was to spend three frustrating war years, and, as he often complained, without access to any scientific library. It was an environment which, though it enabled him to survive, was conducive neither to his special interests nor to his general spiritual development. Although the Kassa tournament was, so to say, on a national scale, it was the biggest chess event of that unhappy war period. Thus, when Richard emerged with the first prize, his name quickly rose to prominence in the chess world. So much so that, a few months later, he was invited by the Netherlands Chess Federation to go to Holland as Chess Master in Residence. Richard accepted the engagement, and, in fact, his stay in the Netherlands, which was first intended to last but a few months, was, with some minor interruptions, extended to several years. More than that, this Dutch episode meant for Richard a decisive turning point in his whole career and life. Up to that time, he had considered chess as a pleasure, a kind of creative hobby, still thinking of mathematics as his true mission and goal. Yet when, after the War, with its crushing defeat for the Austro-Hungarian monarchy, he returned home and resumed his studies at the University of Vienna, he saw himself faced with an entirely changed situation. Such rampant inflation had stricken the country that Mother’s already modest means dwindled almost to the zero point. It was no longer possible for her to provide us with more than the bare necessities of life. In fact, my very limited earnings as a musical journalist and teacher constituted the family’s principal support. Richard had just finished his work at the University and was about to put the final touches to his thesis for a doctorate in mathematics. This thesis, which was said to be an original and important achievement, Richard carried about with him in a small booklet of about 20 pages, wherever he went – at home, with friends, in libraries, in restaurants or coffee houses or, perhaps, to chess clubs. The inevitable happened. He lost the irreplaceable booklet, containing all his hard-won formulas and never recovered it. The shock, as one may well imagine, was a formidable one, and he was, as he confided to me much later, near suicide. It was just at this time that the invitation from Holland reached him – an invitation from a happy, friendly country which, having been neutral in the War, did not know the horrors of inflation, and promised the invited guest security and a congenial life after his suffocating struggle against starvation at home. So, Richard accepted, perhaps not yet fully aware that in one stroke he had exchanged, for better or for worse, a scholarly future, perhaps of greater importance to the world, for a future glamorous in some respects yet in its possibilities limited: life as a chess champion. Later, he was to become very conscious of the dilemma imposed by this decision. It haunted him throughout his life, and he never found a definite answer to it. Yes, from now on, chess dominated his life. After Richard had stayed approximately a year in Holland, a great international tournament was announced, the first after the War. It was scheduled to take place in the summer of 1920 in Göteborg, Sweden. The tournament was to be played in different classes: first, the tournament of the great masters, second a tournament of minor masters, and finally one or two tournaments for advanced amateurs. For the master tournament, invitations had been sent out to all outstanding masters, who, with a few exceptions such as Lasker and Capablanca, accepted. A revealing incident took place in Göteborg the day before the tournament opened. One of the participants in the first master tournament was the famous Dr Siegbert Tarrasch from Nuremberg. 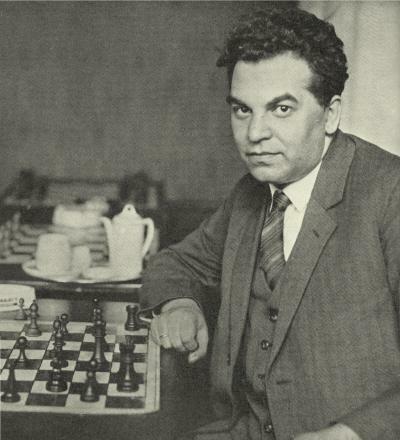 By virtue of a long and brilliant career, with numerous first prizes, and of extensive theoretical writings, his reputation was uncontested as one of the top chess personalities of his time. On the eve of the tournament, when all the masters from the various countries had already assembled in Göteborg, Dr Tarrasch entered a formal complaint with the committee. He protested that the rules for admission to the grandmaster tournament were not rigorous enough, and that masters such as Réti and Breyer had better be transferred to tournament no. 2 for masters of lesser rank. The fact, for instance, that young Réti had recently won first prize in what was after all a minor tournament like Kassa hardly warranted his appearing in the first-class tournament and thus compelling masters of world renown to waste their energy and time playing with perhaps talented but immature candidates. Well, the committee, after some debate, clung to its original decision and though the outcome could hardly have been anticipated by anyone, Richard won the first prize. Breyer was seventh and Tarrasch eighth. [In fact, Tarrasch was one of four players who shared fourth place, and Breyer came equal ninth with Marco.] This result reverberated throughout the chess world of that time. Richard was from then on considered one of the three or four contenders for the world championship – and though he did not fulfill this promise in the remaining years of his life, his reputation as one of the leading chess personalities and a pioneer of modern chess was never questioned. In fact, in spite of some unevenness in his later tournament performances, his actual achievement was acclaimed, though his contribution to the chess evolution of the time was not fully understood and evaluated until after his death. The roughly ten years from Göteborg to his untimely death a week after his 40th birthday, in 1929, are, as far as his performing career is concerned, a part of the general chess record. But a picture of his inner development, insofar as it is explainable apart from the actual chess symbols, may be attempted in the following pages. The core of this description is based on Richard Réti’s own explanations and intimations expressed in frequent conversations with the author. They remain vivid in my mind, though my understanding of chess and my ability to translate the ideas which my brother advanced to me, into the technicalities of the game, are more than limited. If I try to recall Richard’s description of the essential nature and deeper idea of chess, one utterance in particular comes to mind. Richard Réti was of the firm opinion that the usual evaluation of a game or of a player according to whether the game was won, or how many winning games a champion could score, was superficial or at best an over-simplification. Naturally, the profundity of chess cannot be measured by whether a game is won, but it can be measured by how it is played. Yet according to prevailing practise the result alone is what counts, and the player is forced to adjust his effort and method of thought to this goal. This is particularly true since major chess matches are controlled by clocks which measure the time allotted to each player. The most ingenious exposition is of no avail if the time is exceeded by a mere fraction of a second. Now Richard was by no means insensitive to the logic of this practise, for chess can be viewed from many angles. Seen from a certain viewpoint, it is a contest between two opponents, and in this respect subject to the conditions governing every contest in which the decision depends on numerous, often entirely heterogeneous, elements. It is in this sense a mirror of life itself or, to put it in simpler terms, it is a kind of sport. And the sport-like aspect of chess is what is today commonly regarded as its most conspicuous characteristic. Réti, as we have said, did not deny this aspect of the game; nor did he reject another widespread view which regards chess as an expression of strategy. He often maintained that in his opinion chess should be an obligatory subject in the curriculum of any military school. For on the chessboard, he held, the rules of military maneuvering can be studied in their pure form, in theoretical abstraction. Whereas in real life, of course, they have to be adjusted to the given circumstances and available means. It has often been said that chess, particularly in its higher forms, must be classified as a science, purely on the basis of massive logarithmic tabulations, in which the validity of each opening, often of every single move, is discussed ad infinitum. All these elements Richard realized as significant and generally accepted in what constitutes a game of chess. But there is a further element involved which, while perfectly clear to him, seems to be much less generally recognized. It is the fact that chess is also the expression of human feelings and emotions or, in a wider sense, a revelation of the full personality. And in this sense chess is to be considered neither a contest nor a science but an art. Richard Réti thought that in the last essence this phase constitutes the foremost element of the game – its core. It is only against this spiritual and psychological background that Réti’s whole work in chess, his practical as well as theoretical achievement, his uneven career and restless life with its early end, can be understood. Speaking first about the theoretical part of his work, I may point out that the trend toward a new type of chess originated in my brother’s mind at a very early age as a general vision, long before it crystallized into that concrete style known as “hypermodern chess”. Since the latter term, which I think Tartakower introduced, was, though somewhat questionable, soon generally accepted throughout the world, it is obviously too late to search for a more appropriate substitute. I well remember how Richard tried to explain to me the philosophy behind it in approximately the following way. The masters dominating the chess scene of today and the generation preceding them, he said, had developed the game to a point of highest thinkable logic and reason. They established the era, as it were, of common sense in chess. Broadly speaking, the idea was that the player had the best chance to win if his chessmen dominated the most terrain in the attack. Even for me, poor as was my understanding of chess, it was fascinating to watch Richard try to demonstrate these ideas through concrete examples. Here I shall refer merely to one aspect of this whole problem. For my brother did not fail to emphasize – and this, of course, interested me particularly and was discussed at length between us – that, after all, this same trend is visible in our time in almost any artistic field, in literature and the fine arts no less than in music, and even in science, where the rational Newtonian physics has to yield to the almost mystic theory of relativity. It is understandable that this whole chain of thought became gradually paramount in my brother’s mind and overshadowed the chessplayer’s normal desire to win the game. Often in an important move on which his final score in a tournament or match might depend he would blithely try a new system of exposition – just as an experiment. If as a result he lost the game, his thought by no means revolved around the chance he had missed, but rather around the question of whether, by a slight maneuver, or perhaps by an exchange of two moves, his idea could still possibly prove valuable. Sometimes in his final years this desire to play – indeed to live – chess in that purely creative spirit which is perhaps not entirely compatible with its nature, filled him with profound doubt as to the appropriateness of his vocation. He was still in doubt about whether he should not dedicate his life to mathematics or physics and thus accomplish something of greater purpose. But then he consoled himself with the thought that this aimlessness of chess in a material sense vouched for its purity in a creative sense. And, to be sure, his love for chess not only did not subside but even increased with the years to an ardent, consuming passion. What saddened him was the highly competitive, sport-like spirit in which the great chess events were carried out and watched. Indeed, a kind of restless melancholy, perhaps not visible to the outside world but clearly felt by those who knew him well, finally took hold of him. An urge to travel began to possess him, though he must have felt clearly the strain that this imposed on him physically. One evening when alighting from a car he tripped over the kerbstone and broke his leg, which left him with a limp for his remaining years. Several months later he broke an arm. Yet in spite of these obstacles, he never ceased travelling. His tours brought him to many parts of the world: to Argentina, Uruguay and Brazil, countries in which he gave a series of courses on the theory of chess; and to the United States. He also toured the whole of Europe from Spain to the Soviet Union. In the northernmost part of Norway he was welcomed by some isolated chess circles as the first chess master to have ventured so far. After his death I found among his papers correspondence with some chessplayers and chess federations pertaining to a proposed tour of some Asian countries, among them India and the Dutch East Indies. Included as a regular feature in all his tours, besides lectures and courses, were exhibitions of simultaneous games of the so-called “blindfold” type. In playing blindfold, Richard had exceptional facility. He once gave an exhibition of 29 games simultaneously played in this manner – just because, he jokingly said, no more good players were then available in the club. These 29 “blind” games constituted a world record at that time. When playing blindfold, the player, as is well known, sits throughout the contest in the center of the hall, without seeing any of the chessboards at which his opponents are placed. Although the performance usually makes a strong impression on the spectators, Richard did not consider these exhibitions as much of an achievement. “They require just some practise”, he declared, and went on to explain that in these “blind” games one does not try – or at least he did not try – to see the actual position of the game on the board in his mind, although he could have done so at any moment, had he so wished. One simply plays, he contended, according to a kind of “instinctive memory”, knowing which combination or plan is in progress in each single game. The main difficulty comes at the beginning of the performance, when one must follow a pre-planned system of how the first five games will be opened, then the next five, and so on, in order not to confuse one game with another. After the first five or ten moves, each game assumes its own individual character, and then the distinction between them is easy and, as it were, takes place of itself. For those like the present writer, to whom this explanation is hardly self-evident or simple, still more elaborate explanations would scarcely prove more enlightening. At this point, it may be relevant to recall some of Richard’s other ideas. They may seem difficult to reconcile with his actual chess performance, particularly with the extraordinary perception revealed in these blindfold games, or his uncannily swift solving of chess problems. Nevertheless he repeatedly – and in all seriousness – complained that he lacked a natural inborn talent for chess, the kind of talent he felt Capablanca, for instance, or some other masters had. All he had achieved, Richard asserted, was due to his searching mind, and every new insight was given to him only after much frustration. Now, anyone interested in psychology knows that the proportion in which talent and genius contribute to human achievement entails very complex phenomena. The individual to whom the problem refers is often the least qualified to judge it. The original of the above document (typewritten text with handwritten corrections) is now held by the Library of Congress in Washington, DC.